New move is meant to assist genuine foreigners who have, in the past, relied on certification from their national embassies which has been withdrawn by the UK, Australian and American diplomatic missions in recent months. The arrest of the elderly Canadian man shows there is now zero tolerance for immigration offenders caught at check points and with regular immigration police sweeps across Thailand continuing under Operation X Ray Foreigner. 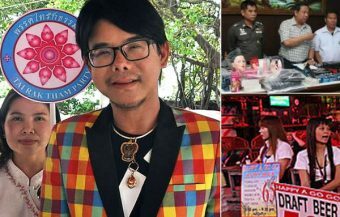 Thailand’s Immigration boss, ‘Big Joke’ Lieutenant Surchate Hapkarn, has thrown a lifeline to foreigners seeking marriage and retirement visa extensions in Thailand. Following a tightening of rules, some key western embassies have discontinued giving income certification letters which were used in the past to meet proof of income requirements as required by Thailand’s Immigration Bureau. Now individual immigration officers have been given the power to exercise their own judgment, in the circumstances of each individual case, until the end of 2019. This means that although the requirements have not changed or been relaxed, foreigners can argue their case with officials for this year’s visa extension but must have a proper chain of evidence for 2020 showing regular and sufficient Thai baht deposits into their Thai bank accounts. It follows another huge sweep across Thailand on Friday which saw over 500 foreigners arrested. However, less than 1% of these were western men. 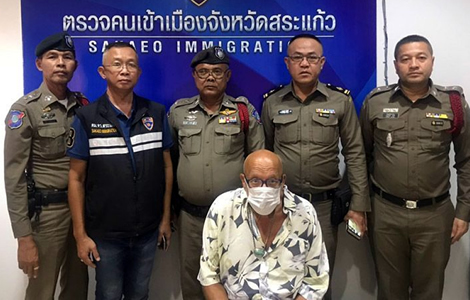 Over the weekend, a 67 year old Canadian man was arrested by Thai police in Ban Khlong Luek as he tried to reenter Cambodia having been found with no entry stamp for Thailand on his passport. 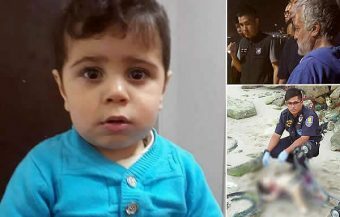 He is being held by Thai police and will face immigration charges. Canadian man, Richard Fortin, arrested over the weekend at Ban Khlong Luek border crossing in Sa Kaeo province by Royal Thai Immigration police as he tried to cross into the Cambodian city of Poipet. The elderly Canadian was found to have been in Thailand without an entry stamp. He told Thai police that he had paid ฿5,000 to someone in Cambodia to get him an entry stamp and to guide him into Thailand at a local Thai market on the border though a hole in a fence. He is being held in the cells at Ban Khlong Luek Royal Thai Police station facing charges of breaching Thailand’s Immigration laws. It comes as Thailand’s Immigration Bureau gave officials latitude in processing applications from genuine foreigners seeking marriage and retirement visa extensions. Over 500 foreigners were arrested in an immigration police sweep on Friday last under Operation X Ray Outlaw Foreigner but only one, an American man, was found to have overstayed his visa. Four other western foreigners were apprehended on other criminal charges in the early morning crackdown targeting over 200 locations in Bangkok. Thailand’s Immigration Chief, Police Lieutenant General Surachate Hapkarn, has offered hope to some foreigners residing in Thailand who are having difficulties meeting the requirement for proof of income to renew or extend retirement or marriage visas in order continuing living in the kingdom. In a new directive, he has given latitude to immigration officers to accept evidence of monthly income requirements even where the bank documents show less than clear evidence of 12 monthly payments to meet the immigration departments criteria for renewing visas. With such visas, foreigners in Thailand are required to show evidence of bank funds of over ฿800,000 where the visa applicant is not married to a Thai woman or ฿400,000 where he or she is a spouse of a Thai national. The alternative or optional requirement is to show clear evidence of a monthly income of ฿65,000 or ฿40,000 for the retirement and marriage visas respectively depending on marital status. Up to recently, foreigners had been able to get certified letters from their national embassies or consulates to support this position. However, quite a few embassies for western countries have this year ceased or refused to provide such a facility. There is some confusion as to the reason behind the change which is causing a lot of hardship and anxiety to foreigners living in Thailand. On one hand, it has been suggested that Thailand’s immigration authorities are anxious that the income guarantee for foreigners, who have extensions granted to their visa, is sufficient to meet their living expenses in Thailand. The appreciation of the Thai baht over the last few years against foreign currencies, a tightening of Immigration Bureau requirements that specify baht deposits and the increasing numbers of foreigners moving to Thailand is thought to be behind the moves by western diplomatic missions to no longer issue the letters certifying the income of their respective foreign nationals living in Thailand. In the meantime, it is reported that Thai embassies in foreign countries are accepting letters from foreign or state agencies for people with pensions and government income for the purposes of granting visas for the first time. 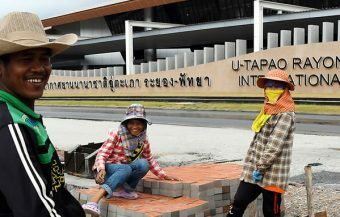 The new dispensation will mean that foreigners who do not have a clear chain of evidence but can show that they have sufficient come to meet the immigration department’s requirements, may be granted visa extensions by immigration officials at immigration offices throughout Thailand based on their own judgment of the merits of each application. 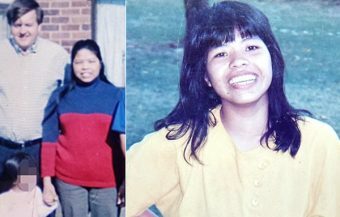 The Immigration chief has made it clear, however, that this leeway will be withdrawn after the end of 2019. From 2020, foreigners will be required to show documentations from their Thai bank accounts clearly showing monthly income to meet their living expenses in Thailand in conformity with the requirements of the Immigration Department. This will mean producing Thai bank account statements and appropriate documentation as to the source of the monthly funds to the satisfaction of Immigration officials. The alternative option of showing a lump sum amount clearly and genuinely available on deposit in a Thai bank account has not changed. The embassies that have so far restricted or discontinued the certification letter to foreigners include the American, UK and Australian missions. It has been speculated that the administrative difficulty of verifying the movement of funds between those countries and Thailand has been one reasons for the change of attitude. 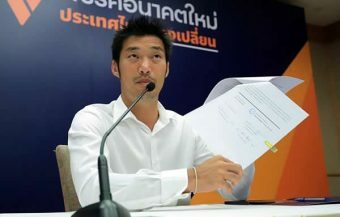 The certification required by the Thai Immigration department insists that they specify that the funds be available in baht and paid in to Thai bank accounts. It is thought that this requirement has presented difficulties for consular officials who are required to ensure that any letter certified is fundamentally true and accurate. The flexibility announced by the Immigration boss gives an opportunity for long term foreigners to renew their visas for this year but to make preparations for 2020 so that their documentation and chain of evidence is acceptable to Thailand’s immigration authorities. 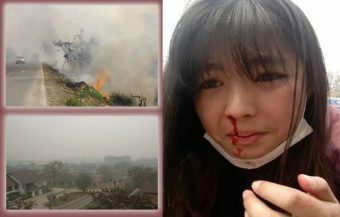 The issue is believed to have caused many foreigners, particularly elderly men living in Thailand on incomes that are marginal to the requirements, anxiety in recent months. Even for those with higher incomes, it is important not to retain and prepare documentation that will be required. Since 2014 and in particular in the course of last year, Thailand’s Immigration police have tightened up requirements and removed tens of thousands of illegal foreigners who had been resident in the kingdom. 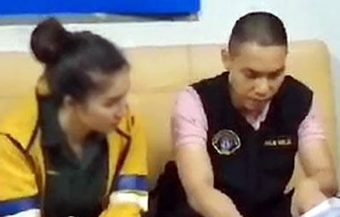 The hugely successful Operation X-ray Foreigner is now a regular and almost weekly sweep across Thailand like a searchlight rounding up foreigners in the country without a visa. 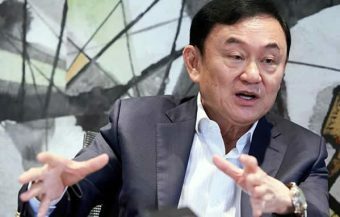 In recent months, the Immigration boss, General Hapkarn himself has indicated that the number of illegals remaining in the country is now at zero but the sweeps must continue to keep the situation under control. This is being bolstered also by attempts to tighten up visa regulations after it has emerged that many of the illegal and often criminal foreigners were using fake visa and scam arrangements to obtain legal visa extensions. Thai authorities are also in the process of upgrading and improving checks and controls on all people entering or leaving Thailand with the ultimate to goal of have iris scanning and biometric data linked to a central database. 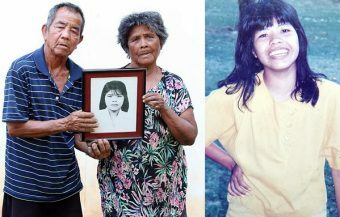 Thai police and authorities have been shocked themselves at the level and extent of abuse and criminality, associated with failures in the past, to uphold immigration laws to the highest standards and to anticipate all possible approaches from corrupt individuals. The latest sweep, announced last Friday, saw 503 people arrested across Thailand. These included 121 Thai nationals caught up with abuses and criminal acts. The Deputy Chief of Thailand’s Immigration Police, Major General Ittiphol Itthisarnronnchai, briefed the media following the early morning operation. The raids occurred in the early morning and were coordinated across the country. There were 217 locations alone in Bangkok where Thai police and security forces attended. Only thirteen foreigners were actually arrested for visa overstays showing how tight the new regime now is in Thailand. These nationals were made up of only westerner, a American man. The other 12 were from Russia, Laos, Iran, China, Mongolia and India. The vast majority of those arrested by the Immigration police were charged with illegal entry into Thailand without visas at all. 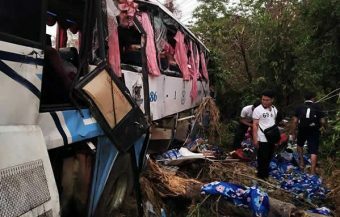 They included 94 people from Laos, 86 people from Myanmar and smaller numbers from India, South Korea and Vietnam. However Thailand’s Bangkok Post revealed that an Australian, UK, German and Greek man were caught up in the trawl and arrested for other criminal offences with over 120 Thai nationals and 50 people from Cambodia as well as 40 from Myanmar. 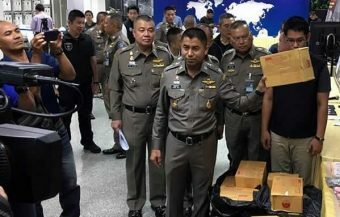 Thai police indicate that the locations of the raids included 4 language academies, 73 registered companies and retail outlets as well as 8 night clubs and 50 hotels. The were also raids on hostels and other places of accommodation. 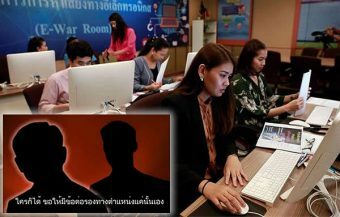 To date nearly 7,000 foreigners altogether have been arrested at up to 6,500 locations in this particular operation but the numbers removed from Thailand are in fact higher. 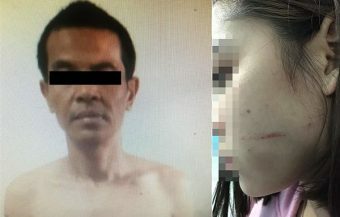 The operation continues and shows the determination of Thai authorities to implement a zero tolerance policy to immigration abuse and associated crime. 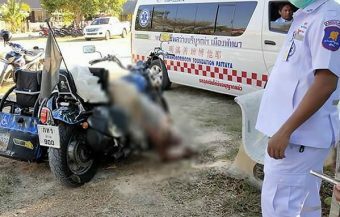 The latest culprit apprehended by Thai immigration police is a 67 year old Canadian man. He was arrested by Thai police as he attempted to enter Cambodia from Thailand at the Ban Khlong Luek border crossing with that country near Poipet. Questioned and later arrested by Thai police over the weekend, Richard Fortin had no entry stamp on his passport. He explained to to them that he had entered the Thailand through a hole in the fence from Cambodia. 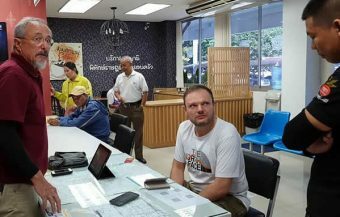 The western man said he had paid an agent in Cambodia a ฿5,000 fee to have an entry stamp placed on his passport and to be guided into Thailand from the Cambodia city of Poipet bordering the Thai province of Sa Kaeo about 200 km from Bangkok on Thailand’s eastern border with Cambodia. The Cambodian city is host to many casinos, illegal gambling and other activities that take advantage of its proximity to Thailand. A range of rackets are run by criminal gangs catering to visitors from Thailand. It is adjacent to the famous Rong Kluea market. This is where the Canadian man explained to police that he had entered Thailand through a fence opening. 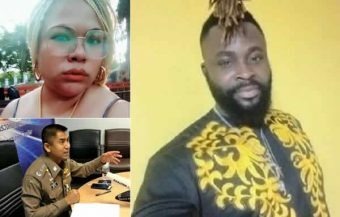 Thai police are dubious however about the Canadian’s story and take a dim view of his attempts to break and circumvent Thailand’s immigration laws in the first place. 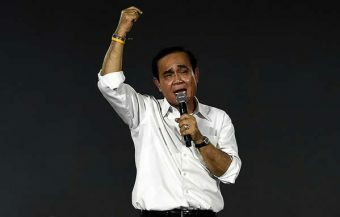 He has said that he was unaware that his passport had no entry stamp which, in his own defense, he said he had paid an agent in Cambodia to fix. 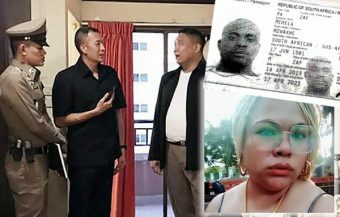 Mr. Fortin is now being held in police cells at Ban Khlong Luek Royal Thai Police station and is expected to be charged with immigration offences by Thai authorities.